Watercolor artist and photographer, Craig Johnson, with his wife, Joy, a writer and former early childhood educator, has created and published four books containing colorful, close-up photographs of Pacific Northwest birds, most found in the Puget Sound area. Their latest book is titled, Our Pacific Northwest Birds & Habitat. Additionally, they have collaborated on two children’s books, which Craig illustrated in watercolor. Through these joint projects, as well as educational presentations, Craig and Joy hope to inspire others to appreciate, respect and conserve wildlife habitat. Together, the Johnson’s have studied ornithology, taking the Cornell Lab of Ornithology Bird Biology course and studying on their own, plus they have spent thousands of hours observing and photographing birds in the field. Craig photographed wild birds intensely from 2004-2008, pushing through increasing physical pain from a degenerative neurological disorder to obtain his photos. In recent years, due to physical disability, Craig has been unable to venture out into the field to photograph or even to paint at home. 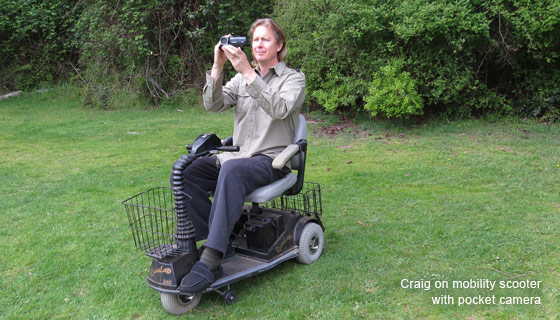 Finding a new medium, he has captured videos of bird behaviors seen in his own yard while outside on a mobility scooter with a small video camera. He compiled them into an hour long film titled, Birds & Backyard Wildlife Habitat, that has been shown at The Clyde Theatre in Langley and The Vashon Theatre on Vashon Island, as well as dozens of other venues. This inspiring 1-hour, 14 chapter DVD shows dozens of interesting bird behaviors filmed in the backyard! Watch wild-life foraging and young birds being fed by their parents. Learn what "habitat" is, tips to attract birds to your yard and more.